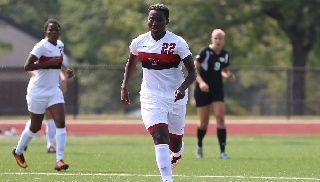 Kalamazoo, Mich. -- The Youngstown State women's soccer team dropped its third straight match after falling to Western Michigan, 3-0, on Sunday afternoon at the WMU Soccer Complex. The Penguins fall to 4-4 on the season while the Broncos improve to 4-2. Western Michigan outshot the Penguins, 23-10, and had 10 shots on goal while the YSU tallied two on goal. Senior Marissa Martin led the offense with four shots and had both shots on goal. Sophomore Betty Anane also had two shots. Goalkeeper Brittany Hoskins had six saves. The Broncos scored in the 26th, 58th and 75th minutes of the match. Youngstown State opens Horizon League play at Wright State, Friday, Sept. 15, at 7 p.m.